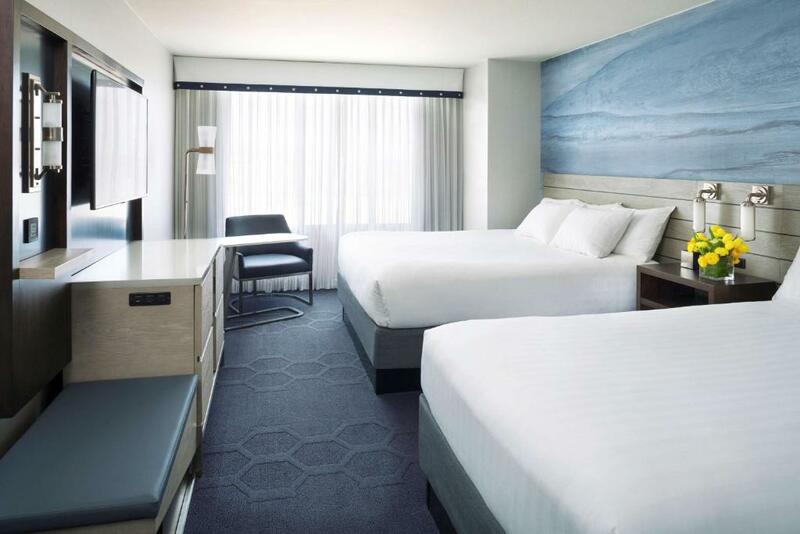 A free shuttle to the Financial District and a heated outdoor pool plus a primo location make the Hyatt at Fisherman's Wharf a winner with our guests. The three-story 313-room hotel is furnished in a contemporary streamlined style. All rooms have an oversized work area flat-panel TV and an iPod docking station so you can play your own personal soundtrack. There is a 24-hour fitness center and a 24-hour business center so you can get your workout or paperwork fix any time the fancy strikes. The hotel's heated outdoor pool makes for another great workout option. The lobby has a cozy seating area around a fireplace there is an on-site restaurant for lounging and eating; in-room dining is also an option. Located at Fisherman's Wharf the Hyatt is about a half-hour drive from San Francisco International Airport. Fisherman's Wharf is popular area with lots of shops and dining. Pier 39 is steps away and home to San Francisco's famous sea lion population. Ghirardelli Square is just a 10-minute walk away and you can catch one of San Francisco's famous cable cars across the street. The hotel offers a free weekday shuttle to the Financial District and there is parking available (for a fee). Keeping money in your pocket can be hard in the City by the Bay especially with all the tempting shopping and dining around the Hyatt Fisherman's Wharf. Don't hold back in fear of the final hotel bill. The Negotiator's done the hard work for you. Now go enjoy your San Francisco treat.